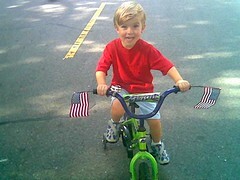 Here are some photos of the Monroe July 4th Children’s Parade at Triangle Park. The paper said that over 1500 people were there. I so enjoyed this. 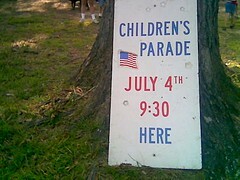 The children and spectators were excited, the weather perfect (but warm), and thankfully the event was well reported. It’s good when positive things are featured in the news, instead of the usual digging for dirt to feed the toxic gossip craving many people have. 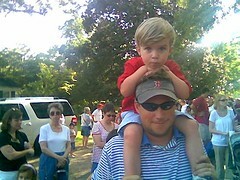 Here is Mason with his father Stewart, waiting for the parade to begin. 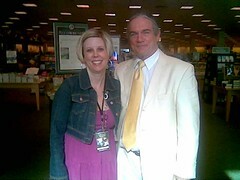 My signing at the new Barnes & Noble in Arlington on Cooper Street on Saturday afternoon was a success. The store is very busy and I was able to tell at least two hundred people the story of Jim Limber. One thing I enjoy about signings is the people I meet. 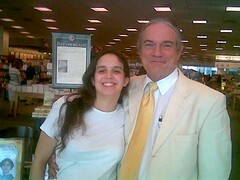 Here is a photo of me and one of the workers, Amanda. Amanda is a writer herself and we had a good talk about writing. Here is one of the managers, Erica. She was very helpful and encouraging.